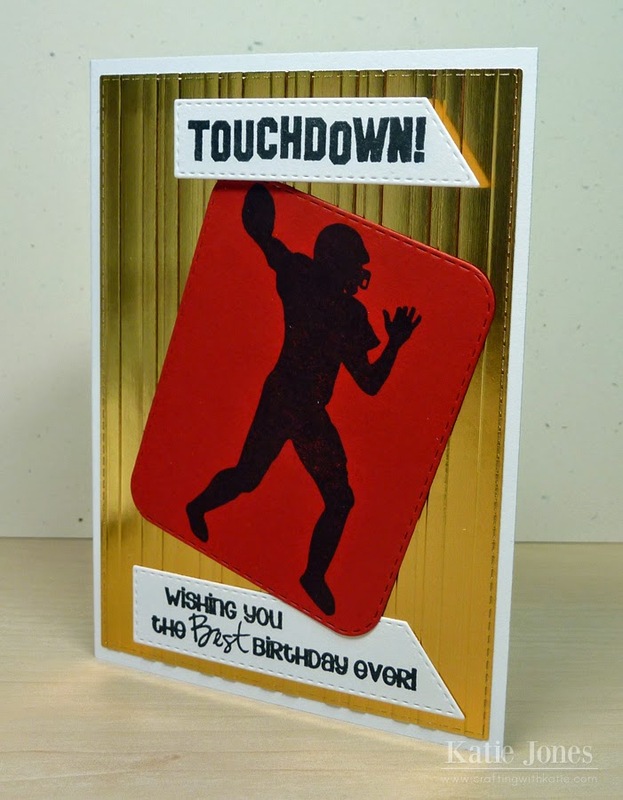 One of my third graders who has a birthday this week is a huge 49er fan, so I thought I'd make him a football themed card in the 49er's colors. I cut some gold paper with one of the rectangle dies from the My Creative Time Stitched Rectangular Frame Dies & More die set and then ran it through my Vagabond with the Cuttlebug Stripes embossing folder. I love embossing this DCWV foiled paper - so pretty! To make my red rectangle I used the MCT Stitched Journal Die, running it through twice, with part of the paper hanging off the die the second time to make it smaller. I stamped the football player with a stamp from MCT's Touchdown stamp set. Then a die cut a couple of the MCT Stitched Decorative Banner Dies and added sentiments from Touchdown and MCT's Wow! So Many Candles. I think my little guy will be pleased with his sporty card! What an AWESOME birthday card Katie! Your student is going to LOVE it! I love it and he will too! Great card! Your student will love his Birthday card. I like the way you did the sentiments and Touchdown! is a great idea. Wonderful job! Katie ~ Omg ~ this is seriously perfect for a boy but a 49er fan!! I bet your student loved this card! I love the gold paper in the background ~ it shines perfectly!!! Love how you used the banner die too! Awesome as always!